Echodyne, a secretive Seattle-area startup company backed by investors including Bill Gates and Paul Allen, is developing a novel, high-performance radar suitable for drones, robots, and self-driving cars. The technology could potentially allow such vehicles to operate independently in a range of conditions. Echodyne will be marketing its technology to government and military customers, the traditional behemoths of the radar industry. But its co-founders are more excited about building a commercial business serving new markets and applications that haven’t used radar before because it was too expensive, too heavy, or didn’t offer a meaningful improvement over existing optical sensing technologies. “We have this concept of radar vision, where you’re actually using radar as a vision system for autonomous and unmanned vehicles as opposed to an exotic military-grade only sensor,” says co-founder and CEO Eben Frankenberg. Echodyne is the most recent metamaterials company to spin out of Intellectual Ventures, the patent licensing and invention business co-founded by former Microsoft chief technology officer Nathan Myhrvold. Intellectual Ventures amassed a significant metamaterials intellectual property portfolio and further developed the technology through its Metamaterials Commercialization Center, which Driscoll directed. The other companies are Kymeta, which has raised $82 million to apply metamaterials technology to satellite communications (and Monday announced a partnership with Airbus Defense and Space focused on the maritime industry), and Evolv Technology, based in Boston and funded to the tune of $12 million to tackle advanced imaging. Last December, Echodyne announced $15 million in funding from Gates, Madrona Venture Group, Allen’s Vulcan Capital, Lux Capital, and The Kresge Foundation. To demonstrate this, Echodyne installed a prototype metamaterials radar antenna—which looks like a stack of printed circuit boards, about the size of a shoebox top—on an off-the-shelf quad copter. It’s capable of lifting a little more than six pounds, though the prototype unit weighs only about 2.6 pounds. The company modified the flight controls so that the drone could autonomously follow a target, using the radar antenna to guide it. Frankenberg and Driscoll say the drone—which they showed off on a conference table, but did not allow me to photograph—followed them around a field. 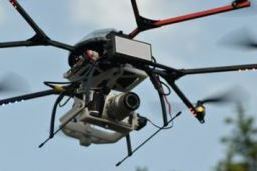 High-performance radar on a quad copter? “We gave a tiny quad copter the ability to see and image the world around it with radar,” Driscoll says, calling it a first for a radar system capable of scanning for new objects while tracking existing ones—capabilities previously confined to high-end electronically scanning radars. “You couldn’t even lift anybody else’s electronically scanning radar with this [quad copter] at almost any price,” Frankenberg says. To explain why Echodyne believes it can upend the status quo, Frankenberg and Driscoll laid out the limitations of current radar technologies—and the advantages of metamaterials. Radar, an acronym dating from the 1940s for radio detection and ranging, was demonstrated in rudimentary form at the beginning of the last century. It works by sending out a pulse of radio waves, which bounce off objects in the way. By measuring how long it takes the radar signal to return to the radar antenna, you can determine the presence and position of distant objects. A phased-array radar system monitors Soviet ballistic missile testing in the 1970s. In the familiar mechanically scanned radars, a single beam is transmitted from a rotating antenna to detect objects in a wide area. That’s the main technology available for commercial applications today, Frankenberg says. Entry-level models for boats cost in the low thousands of dollars. More modern radars direct the beam using phase shifters at each antenna element to create a radio wave front that travels in a desired direction. Frankenberg says the state of the art today is the active electronically scanned array, in which many individual antenna elements work in concert, allowing the radar beam to be pointed almost instantly in any direction—and to switch quickly between scanning for new objects and tracking existing targets. These high-performance systems start at $100,000 and go up into the millions of dollars each, he says. Mechanical radars can only do so much, while electronically scanned arrays remain expensive because of the phase-shifters and amplifiers placed at each antenna element. “The only way to drive the price down is to somehow make the electronics behind every one of those antenna elements cheaper, through volume, but there was no physics change whatsoever,” Frankenberg says.